We’d love your help. 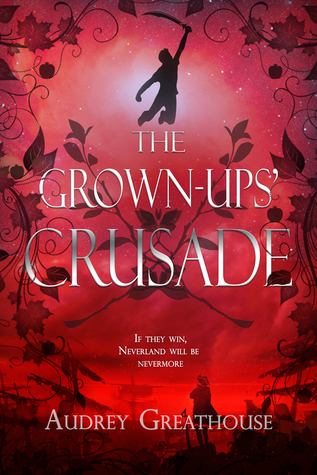 Let us know what’s wrong with this preview of The Grown Ups' Crusade by Audrey Greathouse. The Anomalous Activity Department has plans to finally conquer Neverland by bringing the final battle to the vulnerable island. The children will have to rally fairies, mermaids, and allies from other magical realms to stand a chance against the shado Gwen has returned to Neverland with Peter Pan and the lost children, but this time, the adults are following close behind. Published March 27th 2018 by Clean Teen Publishing, Inc.
To ask other readers questions about The Grown Ups' Crusade, please sign up. Really good! I felt like the ending was sort of bitter sweet, but I loved this trilogy. The breaking of my heart over the end of this book series might not have been as loud as I had expected, but it was as painful as it could be. I love this series so much because I love Peter so much and that's als why I am hurting. So let's get straight to the point first: I have a very deep love-hate relationship with this ending. I think it is great and wonderful and I smile to myself and I want more. At the same time I want to bury my head into the pillows, hide below my blankets and cry my h The breaking of my heart over the end of this book series might not have been as loud as I had expected, but it was as painful as it could be. I love this series so much because I love Peter so much and that's als why I am hurting. Now what I felt strongly during my binge read was that these books could have been one, giant book. I don't think it's bad they split it but thinking about how I might have had to wait for the next book in the series is horrible. I am glad I discovered the series so late and didn't have to wait. Aside from that, this book gave me many, many feels. So many feels. I wanted to be a child again, I felt for Gwen when she was in the between with her feelings, I caught myself feeling bad for some characters I shouldn't feel bad for and then for others I didn't even though the book tried to make me. It was an emotional roller coaster, if you let yourself think about so many of the implications and things in there. The book was also more grown-up than I thought it would be, with so many fatalities and loss... Even now after I finished the book, there is so much sadness. Maybe because there was too much magic lost by making it a good story? I don't know what it is but I love how it turned out while the child in me is struggling against the stupid little things that I am unhappy with and want 'my story' to be fixed. This series was a bit different than I anticipated. Being a big Neverland fan and usually loving to read different writers take on the imagination that feeds this fairytale, this series didn’t do much for me. It was really dry in many parts and in others predictable. There are a few truly imaginative, endearing and page turning nuggets. However, just as those pages start to turn in a furry - the anchor drops and you are thrust back into turning your own pages. Reading this didn’t make me want to This series was a bit different than I anticipated. Being a big Neverland fan and usually loving to read different writers take on the imagination that feeds this fairytale, this series didn’t do much for me. It was really dry in many parts and in others predictable. There are a few truly imaginative, endearing and page turning nuggets. However, just as those pages start to turn in a furry - the anchor drops and you are thrust back into turning your own pages. I really wanted to rate this four stars. It's a chunky last installment, it's well paced and filled with adventure, and the ending-which-isn't-an-ending sat well with me. But the ebook I read had so many typos and spelling and grammatical errors that it really impacted my reading pleasure negatively. I'm not sure why the editing of the last book in the series was so awful (I didn't notice it being this bad for the first two). A real pity. A good resolution to the series. The pacing was different from the other books which have been rooted in wonder and slow-moving awe, contrasted with this book that was action packed from beginning to end. And curses for making me cry while I read this as I was proctoring a medical histology final! Unfortunately, the copy-editing was lacking. As in, almost non-existant. But that isn't exactly the author's fault. I'm happy with where the story went, and I'd recommend the series. The sheer number of typos in this book is incredibly aggravating. At least two per page in the first handful of chapters. The ending is almost satisfying and yet wildly disappointing. She basically abandons Peter which I find deeply selfish. Hard to love this one. Feeling let down.